Here is an overview of the CPS SaveNow Central Air Conditioning & Heat Pumps Rebate program for 2017-2018 for San Antonio CPS Energy customers. Mr Wilson Heating & Air Conditioning is a REGISTERED CPS Energy contractor. We help with the rebate paperwork! 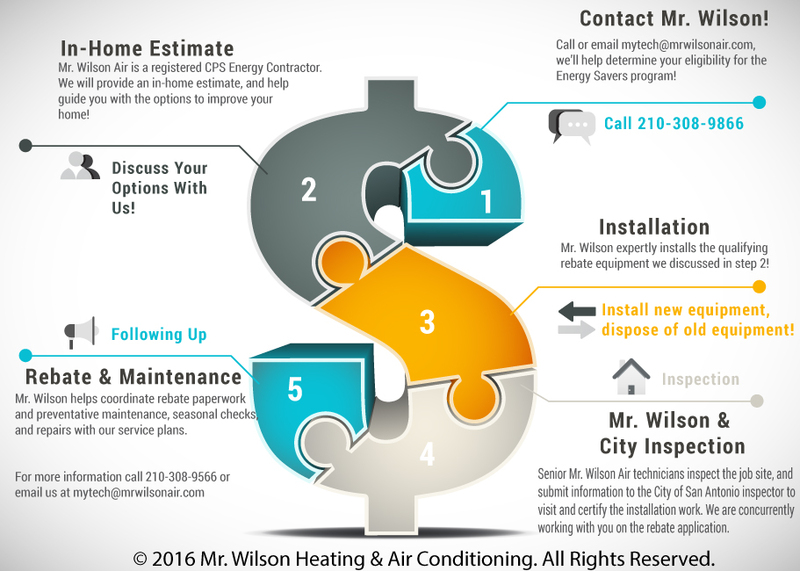 *Mr. Wilson Heating & Air Conditioning is not responsible for CPS Energy SAVENOW program changes or cancellations. Please call or visit CPS Energy Rebates website for current information. The minimum efficiency required to receive a central air conditioner rebate is 15 SEER (seasonal energy efficiency rating ratio). Rebates are tiered for equipment that has higher efficiency levels than the minimum. These rebates apply to home improvement or retrofit projects only. They are not available for new construction projects. In order to qualify for rebates, all HVAC equipment must be installed by an HVAC contractor licensed within the State of Texas. Model and Serial Number(s) for each inside and outside unit must be included on the invoice. To qualify for rebates all units must be at least 15 SEER, 12.0 EER, 8.5 HSPF. Applications must be signed by account holder and include a copy of contractor’s invoice and AHRI certificate. AHRI certificates may be found on https://www.ahridirectory.org.